Fry the rawa in a dry kadai till hot to touch. Grind to a fine powder in a mixie. Powder sugar also. Sieve both the rawa and sugar powder separately. Measure rawa powder and add equal amount of sugar powder. Powder cardamom and add to the rawa powder. In a kadai, put one teaspoon ghee and fry the cashew nuts. Add it to the flour. Mix thoroughly. Same kadai, put the remaining ghee and heat. Keep the flame to low. Take two or three big spoonful of rawa mix and put it in a plate. Pour one or two tablespoon ghee and mix it with a spoon. Then mix it with your fingers and take this mixture into your palm, press it into small lemon size balls. Finish all the flour like this. i made maida halwa, mysore pak,boondi laddu,athirasam and beetroot halwa as per ur instructions, all came out very nicely. measurements are too exact, wonderful and very useful site. please do continue ur job. share what all u know in this thread. Nice to hear that you prepared so many sweets and all came out well. Wishing you and your family a very Happy Deepavali. I should try out all the recipes one by one…shall post how my version come out. Can you post microwave milk powder peda…dhoodh peda !!!!!!!!!!! Eagerly awaiting more microwave recipes !!!!!!!!!!! will u pls tell me how to prepare Badhusha? I have already posted the recipe for Badhusha. Check under Deepavali Recipes. Hi Mam, I have started taking recipes for diwali from your blog. 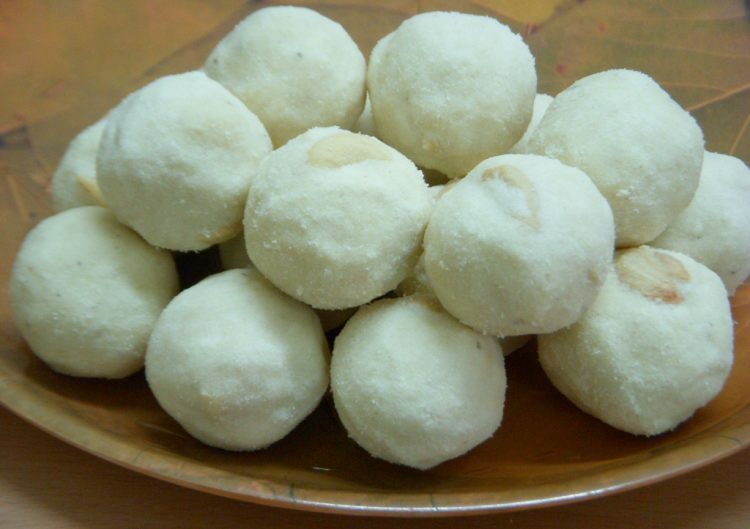 I’m planning to prepare rasgolla which is a favorite sweet for all my family member’s. please tell how to prepare rasgolla and help me in coming out best. You are my mentor for my cookings, so that’s why come up with a request to you. Thank you for your kind comments. I will post the rasagolla recipe shortly, but I do not think I will make it before Diwali. Thank you mam, surely I will wait for your rasagolla recipe. Breakfast recipes are really superb. weekend breakfast are your recipes.first time trying, that’s y on weed end. Happy diwali in advance. Thank you Suchithra for your kind words and wishes. Wishing you and your family a Happy Diwali. I tried your magilampoo murukku which came out very well….thank you for the recipe and i really think your website is useful. Thank you Geetha for trying Murukku and nice to hear that it came out well. Hi Aunty, u recipes are good.. i just tried rawa urundai..I did according to ur steps …but i can’t get the rawa balls. It is breaking even i pour more spoons of ghee..pls where i go wrong..
You have to add hot ghee. If you powder both fried rawa, sugar and add hot ghee and make the balls, it will stay round. Thank u Aunty..ill do the same.. I am very interested in trying al ur recipes, its very simple and super, thank u for simple recipies, can u post some of vathal recipes in ur site , I may try that also with your help. Thank you Aarthi jagan. For Koozhvadam/vathal I have already posted the recipe. For vegetable vathal, will post soon. Thank u for ur awesome recipes. I am really very eager to try all ur recipes daily.